Today has started out kind of strange for me (we woke up about 8:45 and just laid there comatose until 9:45). We were up and running around at 5:30am yesterday for my oldest son's Lego Robotics State Competition that was held in downtown Atlanta. So, I did not cook anything, except my morning and evening oatmeal. In which, I did discover that you can total make a bad bowl of oatmeal if you are not paying attention to what you are doing and you are too tired to think! Anyway, I am so proud of him for making it as far as he did and I think it was such a great experience! Now, that being said...all I have today is a review. I have a lot of house work to do today, but I am hoping there will be some baking done sometime along the way! 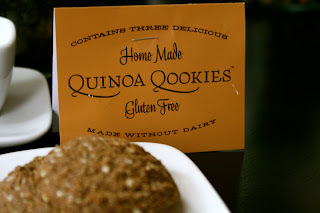 The maker of Quinoa Qookies sent me a package to taste and review. I am always appreciative when I am asked to review products! I received this package in the mail and was excited to give a gluten free/dairy free cookie cookie a try. I do make most of the treats we eat here from scratch, but it's always nice to have a quick go to option in the pantry! I am definitely drawn to healthier sweet options, as that is how I like to eat and feed my family. I loved that these are made with quinoa, since that is one of my newly discovered favorite foods. I had not tried it in a sweet version yet, so I was looking forward to seeing how these taste. Of course, now that the illustrator has celiac, I am definitely happy when I see gluten free options that are healthy for him. That being said, when I do a review, I always look at all aspects of the product and who it appeals to. I am a pretty open minded person when it comes to food because I know everybody has different tastes. I am a lot more open about the way natural sweet things taste and I normally try everything more than once to give it a chance. Because there are four of us here, I like to have everyone give it a try so I can give a full review. Unfortunately, the quinoa qookies were not a favorite around here. I, personally, thought they were a good representation of a natural cookie. I thought they were kind of like a shortbread. I saw another review where they were said to be chewy and mine were not chewy at all. They weren't too sweet so they would go well with a nice cup of tea or coffee. My kids and husband were not very impressed. They are the cookie people in my family and since these are gluten free, I thought I would have the man with celiac give them a try. I also looked up the price and how to get them. I have to say that $4.95 plus shipping seems a little expensive, to me, for three cookies. I know that there are others that would be willing to pay that price, but I just could not imagine doing it. I spoke with the creator of the cookie and he said that he sold out of them at a demo he did at a health food store just recently. So, it appears that a large amount of people do really like them! 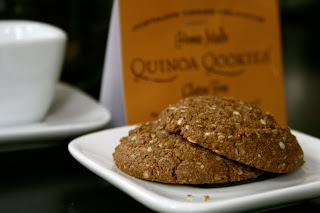 So, if you are looking for a go to sweet that is gluten and dariy free, I would say these Quinoa Qookies are worth a try. Wow! How cool! I love quinoa. How interesting to have them in cookies. Thanks for the review! I've never seen that product before. what a cool idea. i bet they would be easy to make at home! Interesting. I make quinoa for breakfast and sometimes as an accompanying dish but I wouldn't have thought to make a cookie out of it, but now I want to look for recipes. Thanks for posting on my blog so I could find you! !